NEW YORK CITY -- Aerosmith's Joe Perry was taken to the hospital Sunday night after staggering and almost collapsing at a concert on Coney Island in New York City. 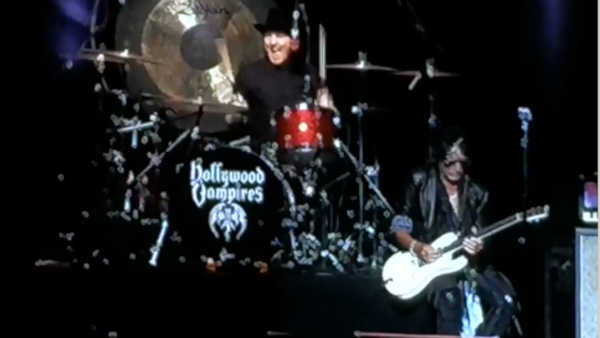 Perry, 65, was performing with "Hollywood Vampires" at the Ford Amphitheater on the Coney Island Boardwalk. The band consists of Perry,rock legend Alice Cooper, and movie star Johnny Depp. Concertgoers say Perry collapsed about thirty seconds into the performance. Fans said he looked "noticeably ill." When he walked backstage, concertgoers said he fell. Firefighters then rushed on the stage to help carry Perry off. A member of the audience, who happened to be an EMT got on stage and gave Perry CPR. Perry is currently being evaluated in the emergency room at Coney Island Hospital. NYPD confirmed to ABC News that Perry was listed in stable condition at Coney Island Hospital, and was later transferred to Columbia Presbyterian Hospital for an unspecified reason.